Michonne is the big draw here, and Samira Wiley's performance alone makes this episode worth playing. We just have to hope the later episodes give her more to do that we haven't already seen before. While this first episode is a bit rocky and uneven, it ends strong, raising the stakes and setting the stage for the other two episodes. The Walking Dead: Michonne still has time to hit its stride, make something out of its supporting cast, and creating a journey worthy of its fascinating protagonist. 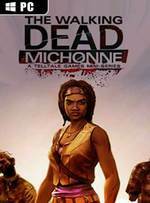 Fans of the comic books will surely love this addition to Michonne’s story, as it gives a glimpse into what went on during her disappearance in the comics. Others will enjoy it for its easy to learn gameplay, terrifying post-apocalyptic world, and its cast of unique characters. Despite some of these setbacks and a debut that feels a bit uneven at points (a strong character and setting undone a bit by unmemorable supporting characters and story) The Walking Dead: Michonneis still a worthwhile experience so far that fans of the series in any way — the comics, TV series, or the previous seasons of the game — can enjoy. In Too Deep hasn't topped either season of The Walking Dead so far, but if you can still stomach a few empty "remember" prompts, you'll enjoy the story they're trying to tell. In Too Deep isn’t bad, nor does it fully suggest that The Walking Dead: Michonne will be a letdown. But if this helping was any indication, it would appear that splitting this side game up into an episodic adventure was a bad idea. As a first episode, this lays the groundwork for the rest of the game, but it doesn’t find the time to do anything else significant as well. 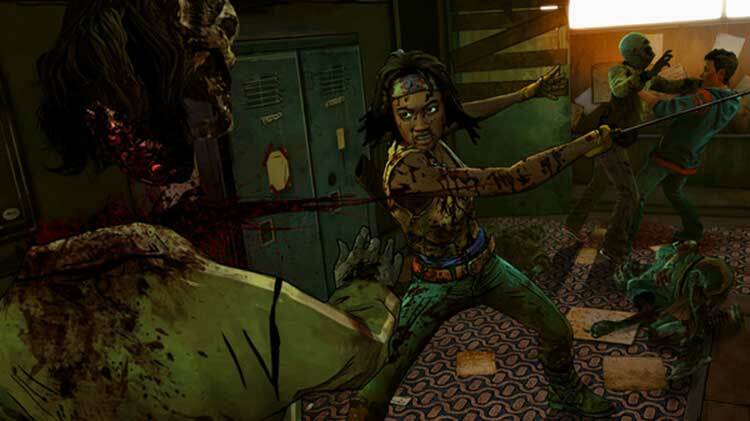 Where Telltale’s Walking Dead stories prior have typically hinged on the sanctity of humanity in those facing unspeakable trauma, Michonne’s humanity already hangs by a thread, and In Too Deep does comparatively little to rebuild or cut away at that thread. 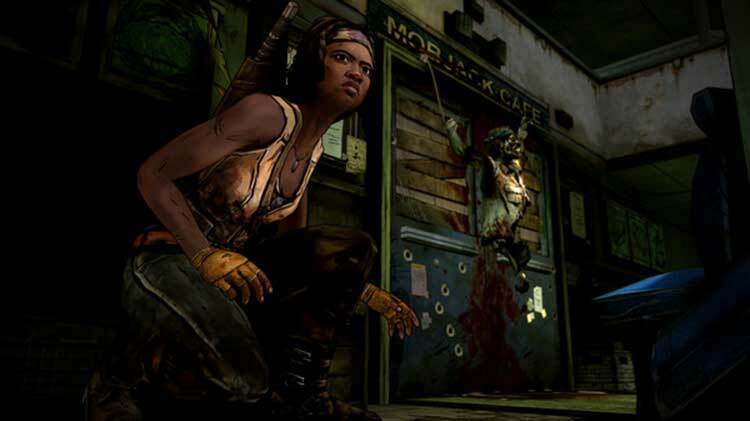 In light of having a kind of protagonist we’ve seen far too little of in gaming, Walking Dead: Michonne can and should go to narrative places we haven’t seen before. 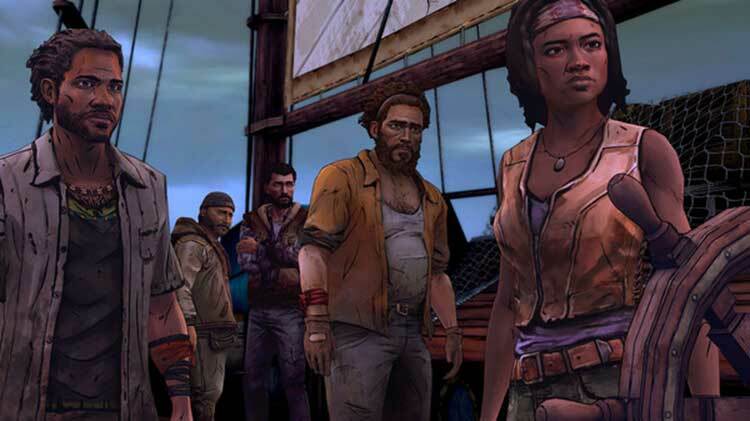 True to its title, The Walking Dead: Michonne - Episode 1 is all about one character, somewhat to the detriment of the story and other characters. Michonne is so well done, though, from her impressive survival skills to the hollow look in her eyes, that she easily carries the entire episode. Even though I wasn’t invested in the story, I did care about Michonne — everything she said, every walker she killed, and what will happen to her moving forward. 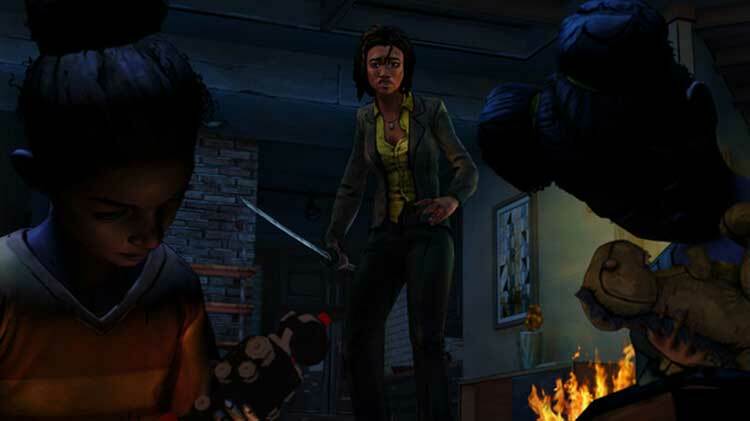 Overall however, The Walking Dead: Michonne's first episode is a solid opening to the mini-series. It has a great protagonist, a nice twist on the choice system, and the same Telltale formula which made the company a success. Its biggest weaknesses stem from being the first chapter of a larger story, as opposed to the standalone episodes which made titles like Tales from the Borderlands so appealing. The Walking Dead: Michonne is off to a strong start. Seeing as it's a mini-series the pacing is a bit different than what you'd normally see and you're thrown in with what we expect will be your main group of characters rather quickly, and the villains of the story are also established, or perhaps they're not villains. We suspect there will be twists and turns ahead. Despite being shorter than most Telltale episodes (I clocked it in about 90 minutes) The Walking Dead: Michonne is off to a great start. To be honest I wasn’t blown away by anything in the story but I’d definitely call In Too Deep “a good episode”. While nothing jaw-dropping happens plot-wise the excellent ambiguous writing and the original water-based setting kept me completely entertained. 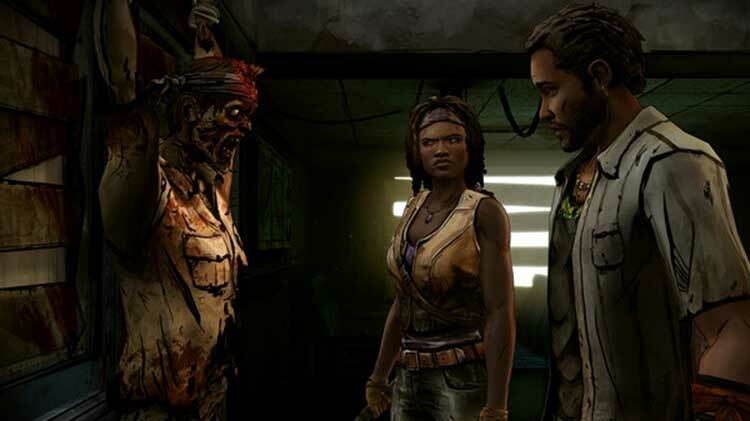 A lot of improvement will be required before The Walking Dead: Michonne can stand up with Telltale’s other Walking Dead series, and I’m hopeful that the next two episodes can do something special with the subject matter. There’s a great space to explore here with Michonne and her past, but I can’t help but feel let down with Episode One’s narrative direction. From here, the only way is up. The Walking Dead: Michonne ofrece todo lo que un fan de la serie espera, aunque a una escala menor en comparación con las dos primeras temporadas; incluso el episodio extra de la primera temporada 400 Days ofrece más a todos los niveles. Y es que su desarrollo no está a la altura de unos primeros minutos brillantes, con personajes poco inspirados a excepción de una gran Michonne y una toma de decisiones ‒y sus posibles consecuencias‒ con menos efectos sobre la trama que en otros títulos de la propia compañía. Esto nos hace pensar que tanto secundarios como enemigos son tópicos y poco interesantes, y que las decisiones que se nos obligan a tomar son más triviales de lo que acostumbra la serie. Esto nos deja una sensación de insatisfacción generalizada con este primer episodio que esperamos se solucione con las dos próximas entregas de las aventuras de Michonne. Questo primo episodio di The Walking Dead: Michonne non è proprio quello che speravamo di analizzare; di sicuro la presenza di Michonne rende tutto più interessante, e difatti la rappresentazione dei tormenti interiori della protagonista rappresenta l’elemento migliore della produzione. D’altra parte, il titolo propone una storia che solo nel finale inizia a farsi interessante, a causa anche del ritmo lento e di una longevità veramente esigua, che non consente di affezionarsi a nessun personaggio secondario in particolare. Se a tutto questo si aggiunge anche una certa imprecisione tecnica, si comprende come questa mini serie non sia iniziata nel migliore dei modi. Il secondo episodio, allora, dovrà riuscire a proporre molto di più.